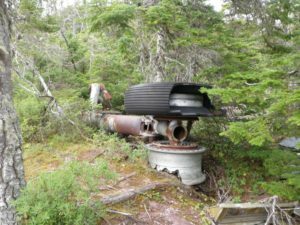 Over the rest of the summer and into the fall, I will be posting a series of articles about American Convair Strategic Bomber RB-36H 51-13721 which crashed near Burgoyne’s Cove and Nut Cove on 18 March 1953. I plan to look at some of the published and online information about this crash, as well as a partial report obtained from AAIR (the full report is available, but outside of my meagre budget). I also hope to get to the site, but that may have to wait until the fall. We had a fairly hit of miss spring when it came to weather, and now I am working at the Logy Bay-Middle Cove-Outer Cove Museum for the summer and won’t have an opportunity to visit the site until the museum closes. 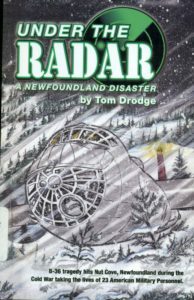 Tom Drodge’s Under the Radar: A Newfoundland Disaster, examines the “B-36 tragedy hits Nut Cove, Newfoundland during the Cold War taking the lives of 23 American Military Personnel”. This is a self-published work that features partial crash reports and personal interviews with locals who remember the crash. Overall, it is an interesting read which gives the reader a lot of information about the Burgoyne’s Cove incident, and very good explanations of the mechanics of the aircraft. 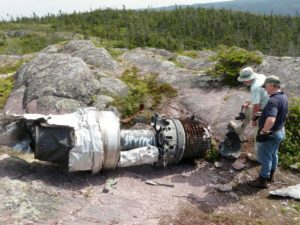 At the Burgoyne’s Cove crash site. Photo by Lisa M. Daly. Drodge reproduces part of the incident report in his book, which he received from the Ellsworth AFB History Office. This “verbatim copy of the investigation report” is certainly of help to anyone researching the wreck, but is not actually a full copy of the report. In fact, it seems to be a mix of Brigadier General Richard E. Ellsworth’s record and part of the incident report, which offers a great deal of information. One of the wheel assemblies, also featured in Drodge’s YouTube video. Photo by Lisa M. Daly. The author attempts engagement by speaking directly to the reader on multiple occasions to try to better put them in the setting. This is particularly apparent when he is describing the crew’s activities in the Azores. Now, this also brings up that there is a great deal of speculation in this work. 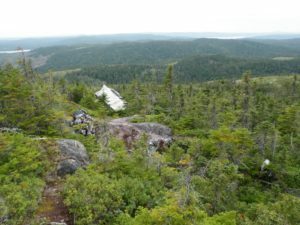 I believe Drodge was inspired by Frank Tibbo’s Charlie Baker George: The Story of SABENA OOCBG which uses the historical record and Tibbo’s own knowledge from his time working in Gander to write the story. Tibbo admits that much of the dialogue is speculation, but Drodge does no such thing. In fact, one of the best aspects of the book is his interviews with those who visited the site soon after the incident, but he is rarely clear when it is the person recalling the events or his own speculation added in. It also makes it difficult, when not knowing what is recollection and what is speculation, to sort out the conflicting information in the interviews. Obviously recollections are not perfect (what historical account is?) 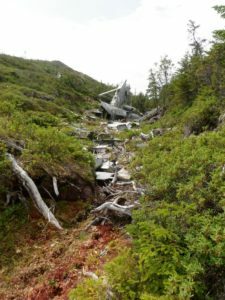 but some of the stories differ with regards to some of the immediate actions in the first days of the incident as well as access to the site. It is difficult to reconstruct a timeline from the interviews without knowing what was actually said by the interviewee. Perhaps my favourite part of this book is the multi-media aspect. Drodge often refers to his visit to the site, and this was recorded is up on YouTube. 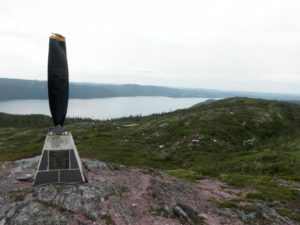 There are a few very good pictures of the site within the book, but being able to see a video of the visit gives a much better idea of the level of destruction and how, on a stormy night, the aircraft did not see the hill. Having a video allows for more people to learn about the site, especially when used in combination with the book. In fact, it is a book that is geared toward those with less aviation knowledge, not the aviation buff. In some cases, Drodge goes into great detail on some aspects of the specs of the aircraft, the bases, and the history of the B-36. In other cases, he makes comments such as “the cockpit was made of some kind of clear plastic” which would be plexiglass or acrylic glass. This material had been in use in aircraft well prior to this incident, as, for example, can be seen in a previous post where the plexiglass navigator’s astrodome shattered in 1947. Drodge also brings God into the discussion of this incident. On the monument mounted at the summit of the site is a quote from Isaiah 40:31. But Drodge also discusses Judgement Day, the Battle of Armageddon and Israel when framing the Cold War in his preface. He also quotes Psalms 139:7-9 and speculates on the similarities to aircraft. There are a few other instances where he discusses religion, which does not always seem appropriate as we do not know if all of those on board were Christian. In fact, some of the discussions of morality and spiritually read as misplaced and more like an author’s soapbox than relevant to the story of the aircraft. Memorial at the crash site. Photo by Lisa M. Daly. That said, I would love to read another book about this crash by Drodge done in Tibbo’s style. Having it written as a well-researched historical “fiction” would perhaps give an even better understanding of the crash.